The Indian tectonic plate is located in the north east hemisphere. It is bounded by 4 major tectonic plates. North of the Indian plate is the Eurasian plate, to the south east, the Australian plate, to the south west, the African plate and to the west the Arabian plate. About 140 million years ago the main landmass on Earth was concentrated together in a super continent called Gondwana which started to break up in four tectonic plates; African, Antarctic, Australian and Indian plates. The rifting is thought to be caused by the rising of a mantle plume which caused the Indian plate to drift northwards and resulted in the opening of the Indian Ocean. The velocity of the drifting of the Indian plate northwards was surprisingly high, 18 to 20 cm per year prior to the collision with the Eurasian plate. During the same period of time the adjacent African and Australian plates moved much slower, 2 to 4 cm per year. 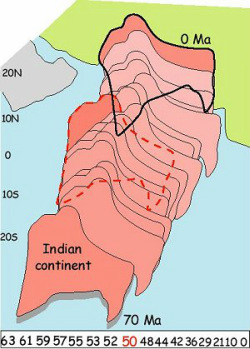 It is speculated that the Indian plate had such a high drifting velocity because of its low lithospheric thickness which extends to about 100 km where the other plates that formed Gondwanaland have lithospheric thicknesses of above 180 km which increased the drag and decreased the drift velocity. As the Indian plate is moving northward relative to the Eurasian plate and collides with it, a convergent boundary is created. On the opposite side, the Indo-African boundary is divergent. The western Indo-Arabian boundary is lateral relative to each other giving rise to a transform boundary. It was previously thought that the Indian and the Australian plates formed one single plate as there is no clear type of boundary but recent seismologic evidence suggests that the two plates will have a transform boundary as the drift velocities of these two plates are different even if the general direction of motion of the two plates is similar. The collision of the Indian plate into the Eurasian plate about 50 million years ago resulted in the erection of the Himalayan mountain chain which contains the highest peaks on the Earth today. Another result of the collision of the two plates is the creation of a multitude of small plates in the eastern boundary of the Indian plate. In addition, because the plate is located in an area with average temperature and humidity the Himalayan mountain chain create a barrier for the clouds which must precipitate in order to overcome the high peaks. This phenomenon generates large amounts of rain therefore some parts of India are subject to some of the largest amounts of yearly precipitation. As the Indian plate is still active today and drifts at a velocity of about 5 cm per year, earthquakes occur in the northern part of the plate. Low to 5 magnitude earthquakes were registered in the urban areas of India, the largest recorded earthquake occurred near New Delhi in 1950 and had a magnitude of 8.5. Because of the low grade metamorphism that resulted in the collision of the Indian plate with the Eurasian plate, many micaceous minerals are mined in the north part of the country, in fact India is the greatest producer of mica blocks and splitting. 2. "Earthquake Hazards and vthe Collision between India and Asia". Retrieved 1983-05-25 March.